The snapshot feature of Grand Theft Auto V isn't just for taking selfies on the top of the Maze Bank. Some have used it to create gorgeous landscapes, and this gamer has taken it upon himself to be the "combat photographer" of Los Santos. No, These Aren&apos;t Vacation Photos. 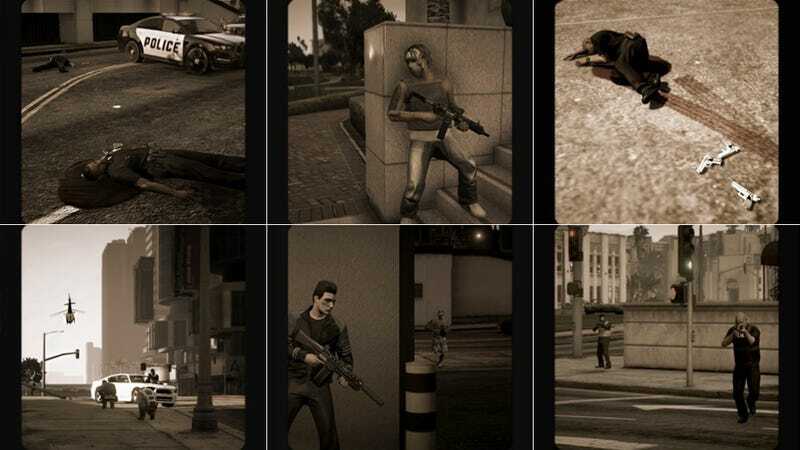 They&apos;re GTA V Screenshots. Redditor cy_sperling on r/games today, says he wanders the city in passive mode, snapping images of his surroundings, both violent and prosaic. His character even sports a helmet and a black MEDIA jacket. "I try very hard to find and use the WEZL News van to drive to the hot spots to take pictures. "It's fun to see who 'get it' and let me get up close while they fight," he says. While most get it, some jackhole in an ICP mask is always trying to run him over. You can see his portfolio at the link; have any of you run into a guy by this description in GTA Online?